Jacob and I were in Thailand a couple years ago scouting Vegan on a Jet Plane locations and enjoying life! Thai food is one of my favorite cuisines, so I built in plenty of time to attend local cooking schools and hopefully learn how to make my own “authentic” Thai dishes. We attended a cooking school in Chiang Mai and learned how to make the most amazing pumpkin hummus. 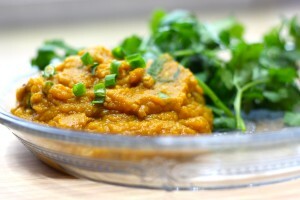 Pumpkin hummus is not what I envision when I think of Thai food, but it was so unique and delicious I still get cravings for it to this day! The original recipe is modified a bit so you can find all of these ingredients in western grocery stores. So here you go! A savory pumpkin recipe to stand out from the crowd amongst your pumpkin spice lattes, ice cream, and other sugary pumpkin treats. As always, this recipe is vegan, gluten-free, and completely plant-based with no added sugars. Good for your body inside and out! Other than the obvious (ahem…pumpkin season) there are plenty of health reasons why you should indulge in pumpkin this fall. One cup of pumpkin has more potassium than a banana. It is a great source of Vitamin A and Vitamin E, both of which are great for your skin! Pumpkin is high in fiber so it is great for your digestive tract. It’s also a good food to keep you full if you’re trying to lose weight. One last important note–make sure to take the time to cut and steam fresh pumpkin! If you use pre-cooked and pureed pumpkin, it just won’t taste the same. Enjoy this savory dip with veggies, rice crackers, spread on wraps, or with “sticky rice” as recommended by the cooking school! Peel and chop one small pumpkin into 1 to 2 inch sized chunks. Place in a steamer (I use a bamboo steamer, but any type of steamer should work) and cook until soft, approximately 25-30 minutes depending on the size of your pumpkin pieces. Once cooked, cool and refrigerate. In dry pan, toast sesame seeds stirring constantly until browned (approximately 3 minutes). Remove from pan. Add in coconut oil and cashews and stir until roasted (approximately 2 minutes). If you're including tempeh in your recipe, cook with the cashews. Remove and crush the sesame seeds, cashews, optional tempeh, and basil together; using a mortar and pestle. Add 1.5 cups of the cooled pumpkin, mint, cilantro, green onion, salt, and tamari sauce to the sesame seed/cashew mixture and continue mixing with the mortar and pestle, or blend in a Vitamix on medium speed until well combined. Season with sea salt to taste. Transfer to a serving dish. Sprinkle with sesame seeds and chopped green onion for presentation. Serves 1-2 people. Enjoy with veggies, rice crackers, in a wrap, or even by itself! Enjoy! Make sure to take the time to cut and steam fresh pumpkin! If you use pre-cooked and pureed pumpkin, it just won't taste the same. You'll likely have steamed pumpkin left over, save for a future recipe or double the servings!